I am up before the sun eating my granola by red headlamp. I hear rustling in the tents around me. Someone's alarm goes off, sounding strangely foreign in the middle of a forest. Everyone is moving , bags are rustling, stoves fire off sounding like mini jet engines. A flurry of activity where there once was foresty silence. We pack and move out, Poppy and I move first. The trail climbs for a few miles before descending. Trail notes indicate that phone service can happen about two miles from the road. That's what we are looking for. We hope to phone a trail angel and have them come pick us up. Trout Lake is thirteen miles from the trailhead. We are hoping that the ride is easier to negotiate because there are four of us. We climb quickly in the cool morning air. We stop every so often to see if we have coverage. By the time we get coverage, Clinic and Bey have caught up with us. We agree that a trail angel would rather wake up to a female voice asking for a ride rather than a male voice so we hand the phone to Bey. She tries several numbers to no avail. People out of town or unable to come in the morning. Poppy give it a shot. He has an English accent so perhaps he’ll have some luck. He reaches Diane and she agrees to come. Yay! Now all we need to do is get to the road. We all take off at our various top speeds. It's all down hill so I am just cruising, my feet always feel great in the morning so I move pretty fast. I see a blue plate by the side of the trail, what??? Coppertone is here! Woo hoo. We pull into the trailhead and Coppertone has cinnamon rolls for us! Someone asks about floats, Coppertone makes us floats! I have a cream soda float. I sit in one of his camp chairs and revel in the experience of eating cinnamon rolls and washing them down with a cream soda float. It's all so delicious! Thank you Coppertone! You are amazing! Diane pulls up just as I finish. Poppy, Clinic, Bey and I all pile into her Prius and we are off. Down the hill moving faster than any of us have moved in the last three or four days, maybe longer. The ride is exhilarating and fun. 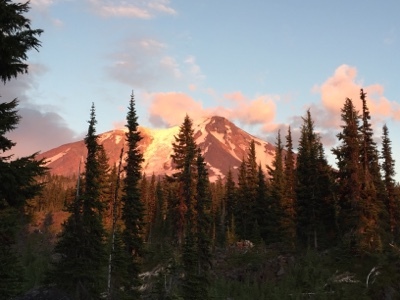 The views of Mt Adams from the road are just stunning. She drops us off at the store using her friend’s driveway and carport as a shortcut because there is construction closing the main road through town. I walk into the store and ask about my box. The cashier points to the door in the back I enter the dark room and another store employee turns on the light. A large shelf of hiker boxes. I slowly look through them searching for purple tape and happy fruit stickers. Here it is, in the back behind the others. I bring it out and stack it on my pack around and to the side of the store. I plug in my charger and charge my phone and external battery. The outlet is in the front of the door above the bench on the porch. Then I follow Poppy over to the cafe. The cafe is in the same building as the garage, gas station, and espresso bar. We sit at the counter. The grill is right there with a young lady working away cooking all kinds of breakfast goodness. Huckleberries are in season. I learn that huckleberries sell for seventy dollars a gallon. I order sweet cream pancakes and coffee. Clinic and Bey show up and we sit and the counter enjoying our breakfasts. We laugh and joke with the cook and the other people working there. I order a huckleberry milkshake. One of the coolest things about Thru-hiking is the ability to eat milkshakes and floats in the morning and not have to worry about getting fat. I enjoy my shake while Clinic reads trail angel's phone numbers off the list on the wall and Poppy calls them. Ray agrees to drive us back to the trailhead in an hour. I rush back to the store to get my food sorted and packed. I check my phone, mostly charged. I buy a couple of snickers to add to my food. I sort everything out of my food box and give the remaining tortillas and peanut butter I bought at Cascade Locks to another Thru-hiker. With my phone charged and my pack packed I head back over to the gas station with Poppy. Ray’s waiting for us and he agrees to wait a little longer while we get some coffee at the espresso bar. I get an iced vanilla latte. It's been so hot down here in Trout Lake and I've been so busy an iced drink is just the thing. We pile into Ray’s vehicle for the ride back to the trailhead arriving there before noon. This is the fastest turnaround of my entire trip. Into town, resupply, eat breakfast, drink coffee, charge my phone, and back to the trail in less than three hours. There are stacks of Thru-hikers stopped at the trail magic. Forward motion ceases when trail magic is present. However, we don't sit down, we're ready to hike. Shifu meets us. He's been sitting there waiting for us to hike. We all set out north on the PCT. Back on trail already. The trail begins to climb. Steep up through the forest. We are all moving at a brisk pace. The trail heads out into a burn. No shade, hot, dusty. It's hard to walk in the dust of other hikers, I slow down. I stop and put on my shade hat and sunglasses. I wait until the dust cloud over the trail clears then I start climbing way behind the others. Up and up it goes. Back and forth across the burn. There are burned snags as far as I can see in every direction. I climb for hours. I pass a PCT trail crew on horses. They are heading back after completing the trail work for the week. Still up, up until the trees begin to thin, till I can see Mt Adams above. Finally the trail turns and starts heading clockwise around the peak. We all stop for a snack in the shade. We have views to the north, Mt Rainier ahead. This is such a different experience, to be hiking in a group, stopping together, planning our mileage and where we'll stop to camp. Clinic’s ideal campspot is a spot with water and a view. We find that and it's big enough for all of us. I'm glad because I am worn out. I feel like I need a break. My feet are so sore by the end of the day that I just want to get off them and sit. I groan and sigh as I set up my tent. I guess I always do this but I notice it this time because Bey is laughing. This is a cool spot with views up to Mt Adams. We look up at a massive glacier that is slowly scouring the northwest side of the mountain. It's so broken and crevasses that it looks impossible to cross. Fortunately we don't have to cross, we are hiking the PCT not climbing mountains. We sit in various places cooking our food, in my case boiling water. I notice that my dinners take way more work and have more steps than everyone else. It didn't seem that complicated when I thought of it way back before I started but now I see it is while I still sit and stir my food in its bag while others are eating or waiting for their food to rehydrate. We laugh and joke about our company we'll start when the hike is over. An international private investigative company. There are positions for each of us. My job is to head up the hacker division. Not that I know anything about hacking. Perhaps a B-grade movie of our cases would work. After dinner Poppy and Shifu light a campfire and for the first time this trip I sit around a fire with other hikers. I watch the sunset turn Mt Adams pink and orange as the sparks and cinders from the fire create mini fireworks in the cool night air. So many thoughts of what a Thru-hike is like include this, yet this is the first time in over twenty two hundred miles that this has happened. It's funny how our thoughts about things are so different than the reality of them. I climb into my tent way later than normal, way past hiker midnight. We all agree to be up early again tomorrow so as to hike thirty two miles to allow us to get to the Kracker Barrel Saturday night. I don't really want to get there Saturday night so my enthusiasm is somewhat less. I don't need or want to hike thirty two miles again. I fall asleep thinking about sleeping in while everyone else heads off without me, I have mixed feeling about that, I'm not sure I want to be by myself again.